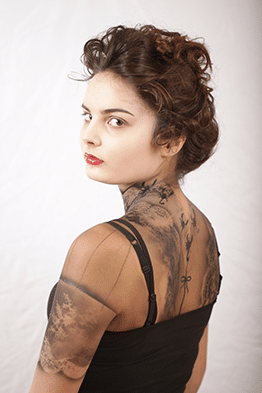 Based in the heart of Pinewood Studios, The Iver Make-up Academy is one of the leading schools for film, television, theatre and fashion make-up. 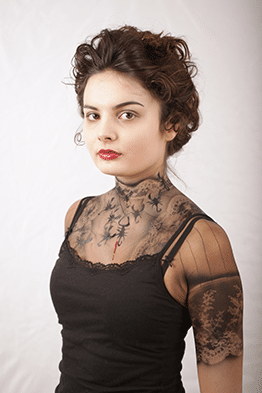 Academy tutor Jane Maier creates original looks for film and television, and specialises in airbrush make-up. According to Jane, “to get the most out of a fantastic make-up tool, you need an in-depth understanding of the kit.” We went along to one of her masterclasses to find out more. Jane’s expertise in airbrushing has allowed her to work with artists including Damien Hirst as well as on television commercials and programmes such as Galaxy and Black Mirror. Her involvement with Mistair UK means Jane has even helped to develop some of the products that are being used within the industry. 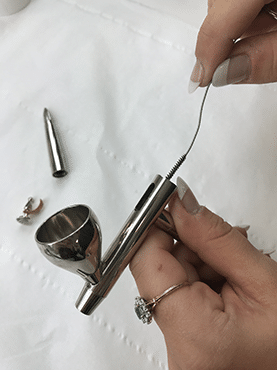 The tools used for airbrushing and their maintenance need to be fully understood otherwise issues such as blocking and bubbling can occur, but they are easy to fix. 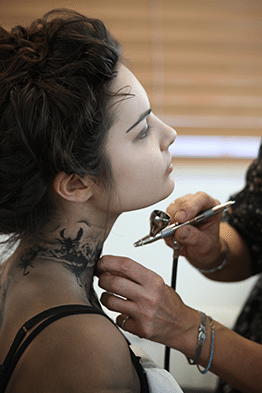 No make-up artist wants to look like they are not competent with their equipment, but proper training can give people the confidence to utilise the advantages of airbrushing. To create a fantasy make-up look, Jane used a mixture of silicone and aqua-based products. Mistair Silicone Foundation is used on the face because it has a sheer-look and a delayed setting time that allows Jane to blend the make-up. Then, Jane used a Temptu eyebrow stencil and silicone eyebrow make-up to achieve a dark brow. Next, Jane got the stencils ready to use. She explains, “you can use off-the-shelf stencils from brands like Temptu, Mistair or Andrea O’Donnell, or you can design and cut your own from acetate”. Jane used a simple hand-cut scorpion design which she repeated in different sizes. This time, a black aqua-based make-up was used because it dries immediately and does not smear under stencils. On top of the heavier silicone foundation, aqua-based make-up gives the impression of thread stitched into nylon fabric. Jane recommends MAKE UP FOR EVER, Dinair, Mistair MistFX and Kryolan as they offer good aqua ranges in plenty of colours. Pieces of shaped acetate were used to mask off any areas that Jane was not working on and to layer up the design for a 3-D effect. Throughout the demonstration, Jane adjusted the compressor to make sure the appropriate PSI is used on each part of the body. PSI 20 is used on the body, to efficiently cover a larger area. A PSI of 10 is used on the face for more control and PSI 5 is used around the eyes to protect the model. She sprayed Premi Air Foaming Aerosol through the nozzle and uses a small brush to clean inside the cup and front parts of the airbrush. Jane suggests using silicone-based cleaning fluids which help to thoroughly clean the machine and ensure its longevity. Finally, Jane added the finishing touches, adding Lancôme Hypnose Mascara in black and Chanel Rouge Allure Intense No. 1 lipstick. 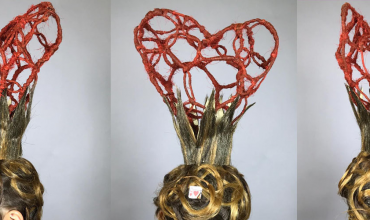 The model’s hair was styled in an up-do. Mistair Airlites Hair make-up was used to add colour on top of the hair after it was set with hairspray.